If you’ve never made homemade jam before, then this is the recipe for you. Super quick and easy to prep. Fresh, local peaches are on sale for $.99/pound in Pittsburgh right now and this is the perfect way to take advantage of them while they’re ripe and enjoy them year-round. 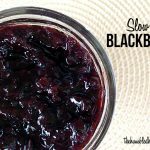 When you see how easy it is to make jam in your slow cooker you won’t go back to making it on your stovetop. Simply combine FOUR ingredients in your slow cooker and let it do all of the work for you. I use “no sugar needed fruit pectin” in my homemade jams to cut down on the amount of sugar needed. No sugar fruit pectin doesn’t contain any type of artificial sweeteners – it’s simply a premium pectin that doesn’t require sugar to thicken jam (the way classic fruit pectin does). 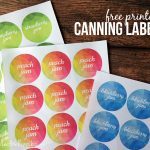 Store your peach jam in your refrigerator for up to a week or use my canning instructions for beginners to preserve in jars for the rest of the year. 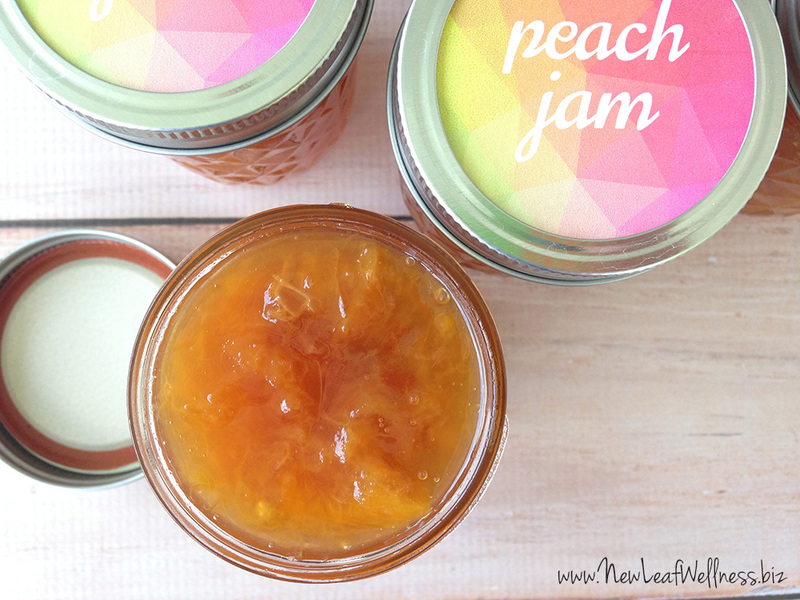 When I can this peach jam, it fills 5-6 8oz jelly jars (depending on how much I eat before canning!). Peel, pit, and slice your peaches. Add them to your slow cooker. 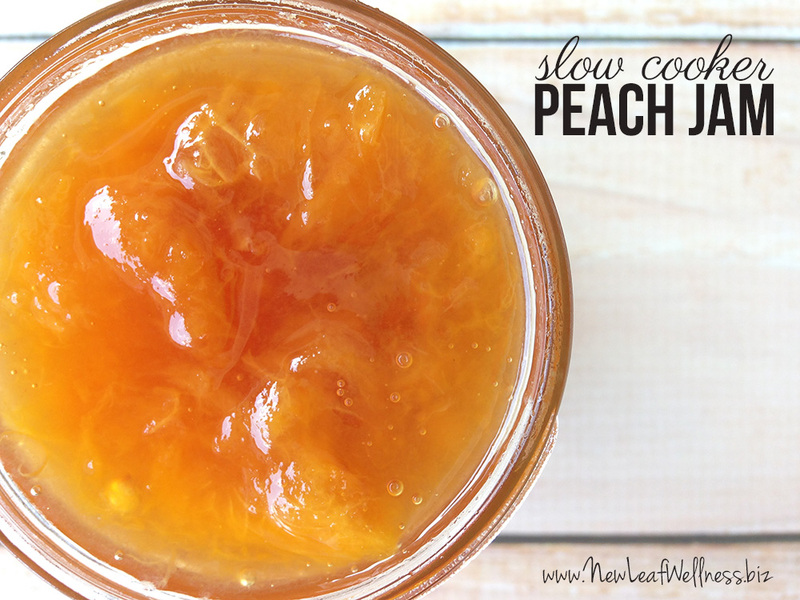 Add sugar, fruit pectin, and lemon juice to your slow cooker. Hi. Is this recipe ok in the crock pot if it’s scaled down? I’ve never tried it, but I think it will depend on the size of your Crockpot. I recommend having your Crockpot at least 1/3 full (and not more than 2/3 full). 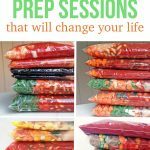 If you have a 4-quart Crockpot – and half the recipe – I think you’ll still be OK. I’d love to hear how it goes if you try it! Hello! If you are using the regular pectin how would that affect the sugar amount? I think you would have to use double the sugar to thicken the jam, but I’ve never tried it myself so I don’t know for sure. Can you reduce the amount of sugar or can you use a sugar substitute and how much!!! Adele, you may be able to reduce the amount of sugar if you use and low/no sugar pectin. Unfortunately, I have not tried doing so. Jam tends to be more of a science (similar to baking) than cooking so I would hate to give you any misinformation. I’m sorry I do not have a more straightforward answer. It may have to be an experiment. I discovered Pomona pectin, which allows you to determine how much and what sweetener you want to use. It uses calcium in a water solution to jell. You can adjust the set (firm, or runny) by how much calcium solution you use. I wonder if it would work in the slow cooker…. I may have to try it. I made this with the low/no sugar pectin and it did not gel/firm up at all. I let it cool before I packed it for the freezer. I’ll use it like a syrup since it’s still so sweet from the sugar. I have a lot to use up in three months! Tried it…. Couldn’t get it to set, but the taste was great! Poured it into stockbot and boiled for 10-12 minutes on stove and added a bit more pectin. Delicious! Glad it tasted good and worked out. What kind of pectin did you use? I don’t see why not. It should freeze for up to three months. I couldn’t get mine to set either. Still amazing taste. I’m just going to use it like a peach butter or syrup for waffles or pancakes. With extra pectin and boiling did that help? Kristy, I love the idea of using it for pancakes and waffles! Yes it did help! I transferred to a pot, added more pectin, sugar, lemon juice and some water then boiled. It thickened up nicely! can you can this once its cooked in crockpot? so this would have a shelf life of what ? You would have to give it a water bath (10 minutes in boiling water) for it to have shelf life. Otherwise, in the fridge. I’m not sure. I’ve never tried. Sorry!! Yes, prepare canning jars as you normally would but leave a quarter inch air space. Make sure you label and date. .Usually shelf time is about 6 months. But I doubt it will last long. Can this be made with Splenda instead of sugar? I believe so, but I’ve never tried. I would follow the sugar substitution directions on the Splenda bag. I tried Splenda and Stevia. Both had a horrible after taste. Not sure how else to make it low sugar and taste good. As written, it contains half as much sugar as store-bought jams and jellies. I think that’s as good as you’re going to get. So sorry to hear that your experiments didn’t work out. Thanks for letting me know! Can you double this recipie? I think so. Do you have a big enough crockpot?